The Salim Group’s Secret Plantations in West Papua. « Marap Indigenous Group claim back three oil palm plantation divisions in Arso. There is strong evidence that the Salim Group has been acquiring and starting to develop oil palm concessions in West Papua province, which could result in the conversion of 117,000 hectares of forest and grassland to oil palm. The Salim Group is one of Indonesia’s biggest business conglomerates and it’s main agribusiness division, Indofood Agri Resources, is the third largest private producer of crude palm oil.1 Although many other major producers such as Musim Mas, Wilmar and Sinar Mas have all cancelled expansion plans in Papua after signing up to commitments to avoid deforestation and peatland development, the Salim Group has made no such pledge. Four plantations in West Papua province are thought to be linked to the Salim Group, some of which are already operational. 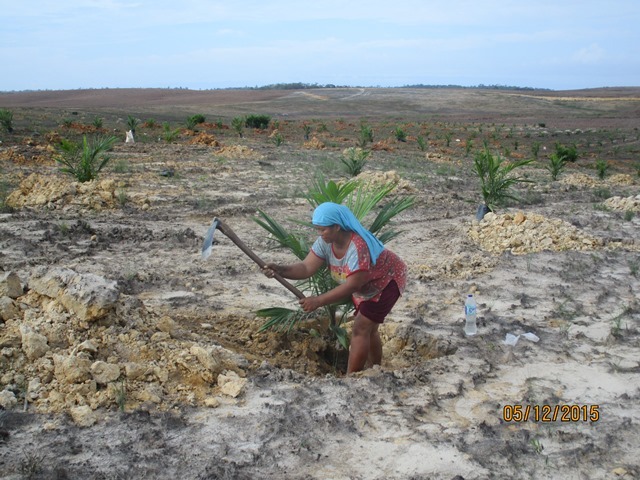 Work started on PT Rimbun Sawit Papua towards the end of 2015 and environmental groups also believe that another company PT Subur Karunia Raya has established an oil palm nursery. 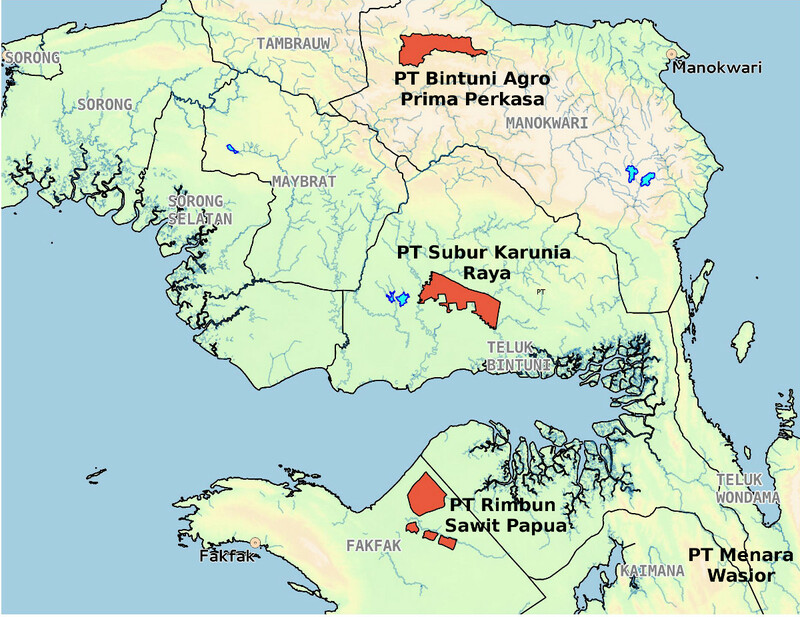 A third concession, PT Bintuni Agro Prima Perkasa, has reportedly planted an area of food crops to win the support of local indigenous people. The last company, PT Menara Wasior, is still engaged in the permit process. Examining the deeds for these four companies shows they are all registered to addresses associated with the Salim Group, and many of their directors have experience working for other Salim Group companies. However, none of them have been incorporated as subsidiaries of Indofood Agri Resources (Indo Agri) which is listed on the Singapore stock exchange, nor any other publicly-traded Salim Group company (Jakarta-listed IndoAgri subsidiaries Salim Ivomas Pratama or London Sumatra, or Hong Kong-listed parent company First Resources). A strong possibility is that these plantation companies are held by shell companies under the ultimate control of Salim Group boss, Antoni Salim. The group is known to hold plantation assets outside the publicly-listed companies, which have previously been incorporated into the main company. Indo Agri is less exposed to international market pressure to cut deforestation out of supply chains than many other companies as it has a strong domestic market in Indonesia through its link to Salim Group food and supermarket businesses. Nevertheless, Indo Agri makes an attempt to maintain an image of being a responsible company: it has joined the Roundtable on Sustainable Palm Oil (RSPO) and publishes detailed sustainability reports. However, if the same corporate group uses an non-transparent ownership structure to shield a set of plantations which would not meet the RSPO’s environmental and social criteria, then these initiatives are clearly just greenwashing. 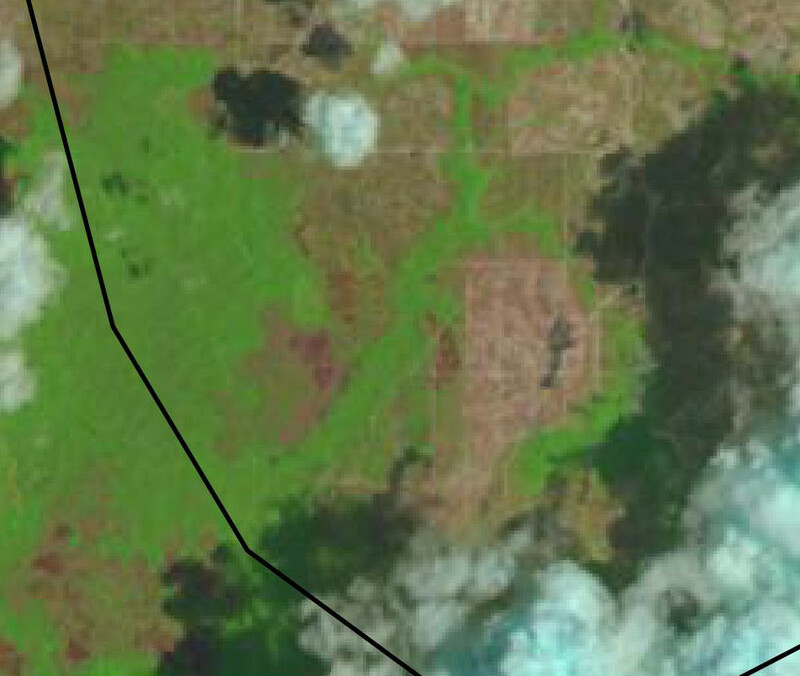 Work is believed to have started at some point in 2015 on this concession around the Bomberay transmigration area in Fakfak Regency.2 By February 2016 the road structure could be clearly seen on satellite photographs, already extending over much of the south-west of the concession. Although part of the concession is forested, the majority is made up of savannah, or grassland, one of the few such areas in West Papua. Some deep peat is thought to exist along the Otaweri River and nearby swamps in the northern part of the concession. No problems between local indigenous groups and the company have been reported. However the company has hired a recruitment agency, Sinar Utama, to source 1200 male workers from Java to work on the new plantation,3 and the result of these demographic changes are yet to be seen. PT Rimbun Sawit Papua was set up in 2010 by Jeff Setiawan Winata, a businessman from Bandung with experience running businesses in West Papua. In 2011, two companies bought into the business, PT Palmandiri Plantation taking 30% of the shares and PT Sawit Timur Nusantara taking 50%. PT Bintuni Agro Prima Perkasa has owned a concession in the Kebar valley west of Manokwari since at least 2009, when it was issued with an initial in-principle permit to release land from the forest estate. The company fell into a period of inactivity for several years, but then was bought by new owners in July 2014. On 29th September that year, on Zukifli Hassan’s last day in office as the outgoing forestry minister in the previous cabinet, he signed the final permit to release 19,369 hectares of land to the company. Local forest activists have spoken to company employees and report that the company is active around Jandurau village. In the last year it has reportedly planted around 20 hectares of corn, soya and peanuts as an incentive to persuade local indigenous people who hold customary land rights to accept the company’s oil palm plans. The Kebar valley is located around 100 kilometres West of Manokwari city, along the route of the Sorong-Manokwari road. The valley bottom is known for its grasslands, which are known for a medicinal plant (Biophytum petersianum Klotzsch) which is common in the area. Since the 2014 purchase, 99.6% of the shares have been held by PT Cahaya Agro Pratama, which also controls a significant stake in PT Rimbun Sawit Papua. The man named as President Director, Gunawan Sumantri, was Operational Director of a Salim-linked plantation PT Gunta Samba Jaya in 2014,8 and another director, Daud, was previously a commissioner of PT Mega Citra Perdana, PT Gunta Samba and PT Multi Pacific International which were eventually incorporated into PT Salim Ivomas Pratama.9 A commissioner, Wiandi Halisantoso, is also President Director of PT Rimbun Sawit Papua. PT Subur Karunia Raya’s concession, located on forested land to the north of Bintuni town, had obtained an in-principle permit to degazette state forest land in 2011, but then there were no further reports until a definitive permit to release 38700 hectares of land from the forest estate was granted in May 2014. There are unconfirmed reports that work started on the oil palm nursery on the concession towards the end of 2015, but no specific information is available on the current situation. PT Menara Wasior has permits for a 28,280 oil palm plantation in a forested area of Naikere and Kuriwamesa sub-districts of Teluk Wondama Regency in West Papua. It is at a less-advanced stage than the other three concessions as the Forestry and Environment Ministry has not yet granted release of forest estate land for the plantation. Civil Society Organisations have not yet been able to obtain accurate data about concession boundaries. Although the evidence presented here is not absolute proof that the four companies are directly owned by Antoni Salim or members of his family, there is strong evidence of a connection. Three of the four companies are owned by companies which appear to be shell companies, as their names arise infrequently in internet searches. The last is owned by a building contractor which appears to have no existing oil palm plantations. Key personnel for all of the plantations have links to Salim Group companies. Some have worked for PT Kayu Lapis Asli Murni, which is known to be a Salim Group company, others for to PT Gunta Samba and other Salim Group plantation assets in Kalimantan, or have been directors of a set of plantation concessions in Jayapura and Sarmi Districts for which the permits were revoked in 2011 due to overlapping claims. The registered addresses of the four companies and their principle shareholders are mostly addresses which appear to be linked to the Salim Group. Several can be traced back to the Duta Merlin office complex in downtown Jakarta, where many Salim Group companies are based. Others are at a Jakarta timber yard belonging to PT Kayu Lapis Asli Murni. It is worth focussing in a little more detail on the link with two Kalimantan plantations, PT Gunta Samba and PT Gunta Samba Jaya, as it highlights the close relationship between the publicly-listed and privately held parts of the Salim Group. PT Gunta Samba was bought by Salim Ivomas Pratama in 2007 from Rascal Holdings Limited, a British Virgin Islands registered firm owned by Anthoni Salim.18 PT Gunta Samba Jaya (alongside several other Salim Group companies with nearby concessions in the East Kutai district of East Kalimantan) was not part of that deal. Its immediate owner now is PT Andhika Wahana Putra, and while that company’s deeds were not available to check if there is still a link to Rascal Holdings Limited, Salim’s supermarket group Indomaret is known to have invested in the company.19 Even though PT Gunta Samba is officially part of Salim Ivomas Pratama and PT Gunta Samba Jaya is not, the two companies remain closely aligned. They are both officially registered at the same address in the Duta Merlin office complex.20 Both companies have described themselves in communications such as job adverts as being part of the Gunta Samba Group, or more recently, Indo Gunta Group. In August 2015 adverts for jobs in Kalimantan and West Papua were sent out on PT Gunta Samba headed paper.21 However, no company declared as a SIMP subsidiary has operational plantations in West Papua – almost certainly the work would be located at PT Rimbun Sawit Papua or PT Subur Karunia Raya. PT Gunta Samba Jaya came under fire in 2013, for clearing orangutan habitat in Kalimantan.22 When the Centre for Orangutan Protection tried to follow up the case through the RSPO mechanism (presuming that PT Gunta Samba Jaya was related to Indofood Agri subsidiary and RSPO member PT Gunta Samba), Indofood Agri boss Mark Wakeford sent a curt email stating that they ” do not have any shareholding in PT Gunta Samba Jaya and it is not part of the IndoAgri or SIMP Group”. 23 As the oil palm industry faces increasing commercial pressure to clean up its act regarding deforestation, peatland development and exploitation of forest-dependent peoples, presenting an ethically responsible image can be vital to avoid losing customers and investors. The Norwegian Government Pension Fund Global has already divested from the Salim Group’s main public umbrella company,First Pacific, on the grounds of Indo Agri’s environmental destruction.24The Salim Group appears to have reacted to this challenge by picking and choosing which of its plantation assets into its publicly-listed businesses, and carefully shielding the more problematic concessions behind layers of shell companies and offshore firms. In Kalimantan where some of these hidden companies are already operating, they have been found to have been bulldozing the habitat of endangered orangutans – the sort of thing which can be highly damaging to a company’s reputation. The four concessions in Papua.where work is just starting now, will also cause major deforestation and potential conflicts with indigenous communities. Indo Agri, First Pacific and the Indofood brand must be seen as responsible for any problems they create. This entry was posted in Around West Papua and tagged Indofood Agri Resources, PT Bintuni Agro Prima Perkasa, PT Gunta Samba, PT Kalamur, PT Menara Wasior, PT Rimbun Sawit Papua, PT Subur Karunia Raya, Salim Group. Bookmark the permalink. Comments are closed, but you can leave a trackback: Trackback URL.